As we shimmy our way across the map with our little house on wheels, I’m struck by a strange reality: people live over here too. Obvious I know, but it stands out in my mind just the same. Perhaps I’ve been reading too many early American stories with my kids. But I feel like a pioneer traveling to new land only to discover we are not the first ones to travel here. Perhaps the trouble is that we are headed East instead of West? That must be it. We are currently in eastern Indiana. What has previously only existed as an empty, orange-colored section on my laminated state map is now multi-dimensional and bursting with fall foliage, lovely landscapes and an occasional southern accent. Our little Idaho license plate is a lonely minority among our neighbors on Hwy 74. We are swimming in new seas folks. Countless times when we are asked, “Where are you from?” we are met with the response, “Oh, we don’t get many from Idaho around here.” We’ll do our best to represent you well Idaho! For the last three days we have crossed over the Ohio river and dipped down into Kentucky. 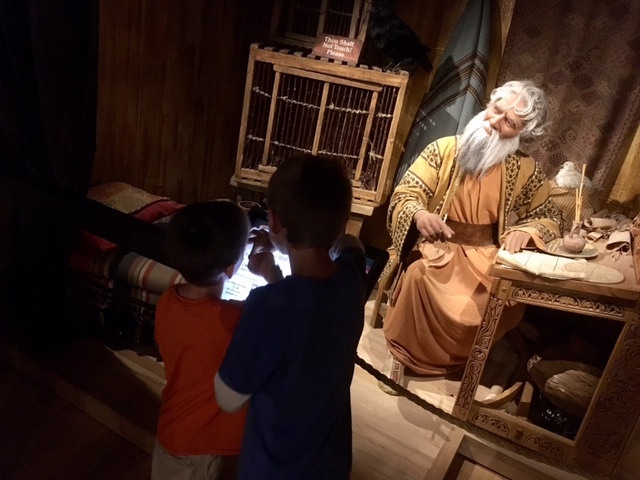 Two days were spent at the Creation Museum and one at the Ark Encounter. While its difficult to summarize the past three days into an encapsulated description, I can touch on some of the highs and lows from our kid’s as well as our parent’s perspective. At both locations we discovered that the enjoyment went up proportionally with the kid’s ages. After the first day at the museum, Quinten (age 7) exclaimed, “Well that was a waste of money.” At the end of the second day however, both he and his younger 5 year-old brother were more optimistic, partially due to the fact that they were allowed to play longer with the plastic dinosaurs in the gift shop before leaving. 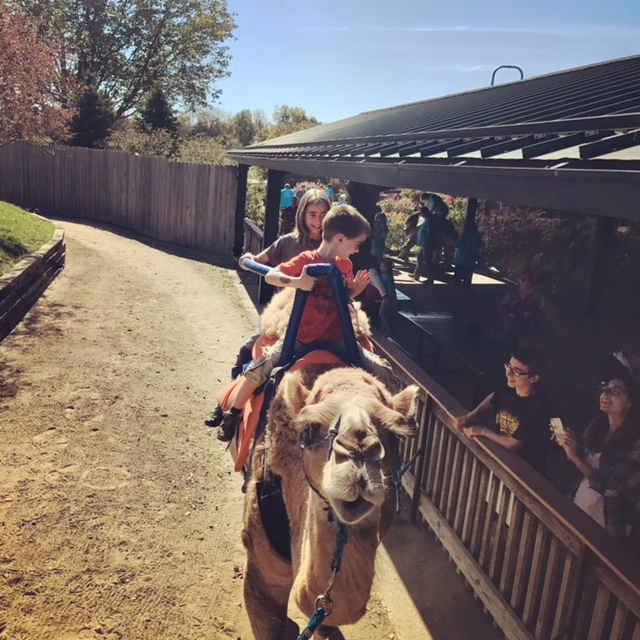 For our youngest three kids, the highlight was the petting zoo which featured a variety of animals such as goats, chickens, sheep, alpacas, a cow, camel and even a zorse and zonkey (yes, you read that correctly). 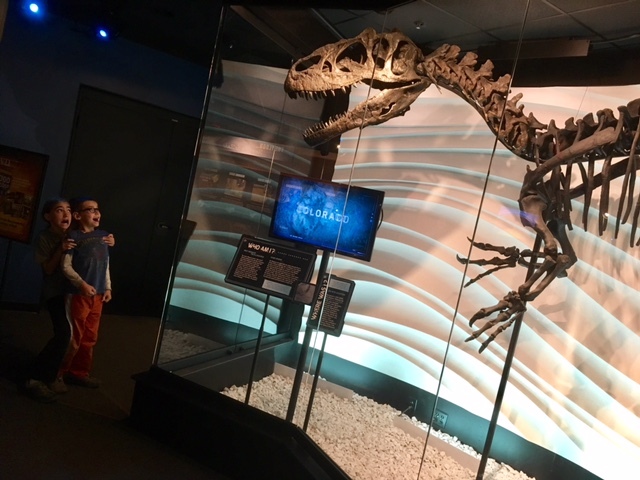 At the top end of the age scale, Hunter (13), was so enthusiastic about his visit that he begged to stay longer on the first day and was first to be ready to leave for the museum the next morning. He was like a sponge soaking up all the information the displays had to offer and summarizing some of his favorite discoveries. Borrowing my phone and ear buds, Hunter also found the audio tour a great way to learn additional details as he moved through the museum. At the end of the day we ordered the first Answers book for Teens (affiliate link) because his interest was spiked so high to learn more. Tap a question on the screen and hear Noah answer it! As a parent, I enjoyed that many of the displays were created interactively with kids in mind. Asking Noah questions or helping to build the ark by answering questions via a computer touchscreen drew them right in, as did a little museum scavenger hunt page offered at one of the first displays (bring your own pencil). I noticed rooms for nursing mothers, changing stalls in the bathrooms and easy ramp and elevator access if you are using a stroller (provided it wasn’t too crowded). 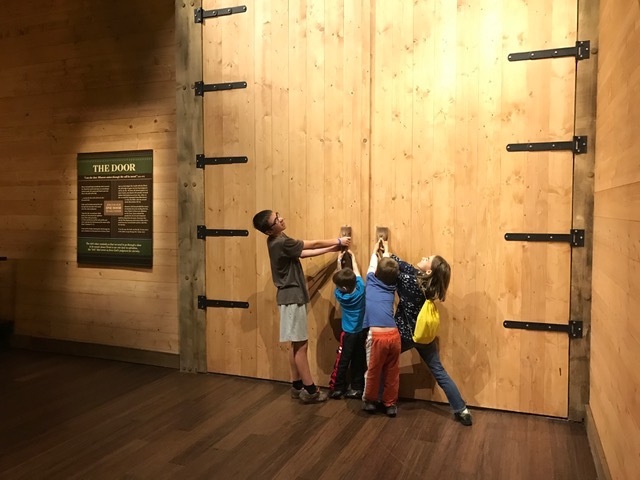 However, may areas of the museum, while impressively designed, relied heavily on reading and attention inevitably waned soonest with the littles. Answer questions about ark to help complete construction. Final thoughts on the Creation Museum: Definitely worth our time, however very pricey for a family of 6. Everyone over the age of 5 requires a ticket and kids 13 and over are charged the adult rate. Our ticket did allow us to return a second day which proved to be helpful in seeing everything with younger kids in tow. I would really love to see lower prices for the kids and I’d like to see the adult rate match adult ages. Be aware that there are several “add on” attractions (zip lines, camel rides, special talks, planetarium shows, etc). I’d recommend looking these over on their website ahead of time so that you can decide what you plan to do while there. A few weeks before our visit we informed our kids that a $5 camel ride would be optional if they wished to save up their money for it. Two of our kids saved and enjoyed their bumpy ride. There are a few free 60 minute lectures offered a few times a day. They are interesting and worth it for teens and up however, because of the labyrinth design of the museum, it is not easy to exit quickly once you have begun touring the displays. Should you wish to attend a lecture, plan accordingly. We saw two videos while there. The Last Adam contains some images of the crucifixion that may upset younger viewers. The Men in White video was appropriate for all ages and included some sound/light/water effects that were fun for the audience. Both days we found that the crowds were heaviest before lunch. I’d recommend avoiding the weekends or holidays if at all possible. You can purchase your tickets ahead of time online. While standing in a long ticket line, we regretted not doing that. However, it did appear that your online purchase might be scannable on your smart phone so you could possibly even purchase your ticket while standing in line if you forget like we did. There are nice outside picnic tables. We brought our lunch to save money. However, there is a café on site if you prefer to go that route. They also have an ice cream stand as well as fudge made on site that smells divine. They have free (very fast) wi-fi so be sure to look for (or ask) for the password to use that as it wasn’t prominently displayed and we could have easily missed it. It’s difficult to articulate what it was like to walk beside and then into such a structure. Awesome seems appropriate, yet it is an overused statement, that has unfortunately been watered down in our culture. It humbled me and made me feel small in light of the powerful God that skillfully directed its construction. The interior displays were both impressive and informative while also being incredibly intricate in detail. 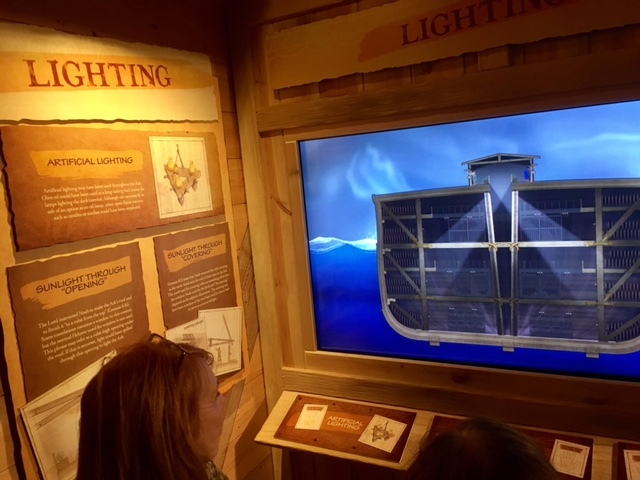 Every possible question and skepticism I’ve thought of or heard was addressed from, “How did they fit all the animals on the ark and care for them?” “Was the flood global or local in extent?” and “Isn’t the flood just a fairy tale or story to teach a moral lesson?“ to questions I’ve never thought of such as, “How could they light the ark or get fresh water?” Beyond specific ark questions was scientific reasoning related to the Ice Age, the Grand Canyon, early civilizations, race distribution and languages–all fascinating, well thought out and scientifically supported. I’ve previously spent a good deal of time on the Answers in Genesis website so several of their displays contained content familiar to me. I’d highly recommend checking it out for yourself if you have any questions related to how the book of Genesis (the first book of the Bible) relates to the topics of origin, evolution, the flood, aliens, fossil layers, carbon dating, age of the earth, etc. They have a very extensive database of articles so you can easily search for any topic you have questions about. 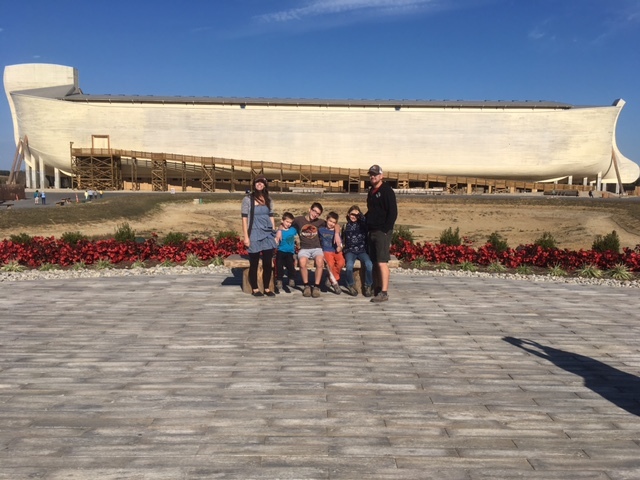 After our visit, I asked the kids to rate their impression of the Ark Encounter on a scale of 1 to 10 and what could have made it better. Hunter (age 13): rating of 10: nothing could have made it better. Ashlyn (age 10): rating of 9: could only be better if the animals in the cages were alive and could be played with. Here is Ashlyn’s personal blog post of her ark experience. Quinten (age 7): rating of 3: the ark was ‘too big’ so it took too long to walk through (i.e. if God could have made the ark smaller, it would have been a lot easier on him today). Tanner (age 5): rating 5: he was ready to leave at lunch time but had a good attitude when we returned for a few more hours. 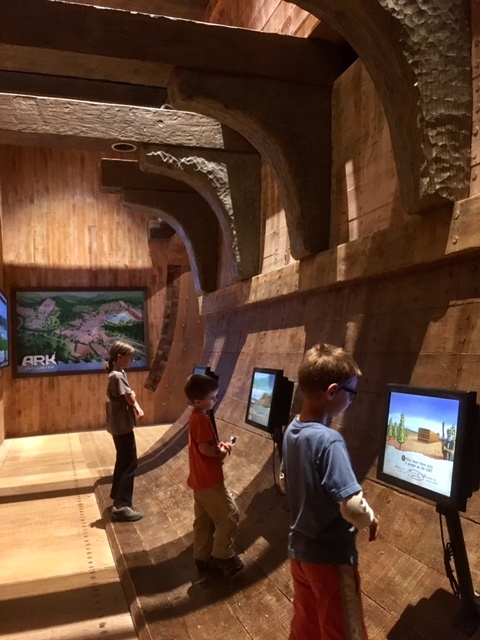 We unanimously agreed that if had to choose between visiting the Creation Museum or the Ark Encounter, we would choose the Ark. Our reasoning was based on our opinion that both offered great content but being inside the ark was an experience that you can’t get any other way. 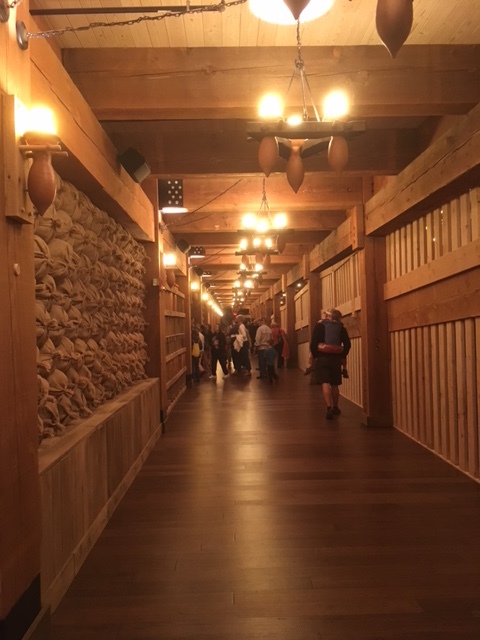 We spent about 6 hours total at the Ark Encounter including our time returning to the car to eat lunch. Be aware that you are shuttled to the ark from the parking lot, so if you bring a lunch and leave it in the car it will take you longer to get to it. Again, the crowd was much smaller after lunch. Some of the displays that required more reading had a line. We skipped them and returned after lunch when the lines were slower. We visited mid-week on a Wednesday. I suggest avoiding the weekends or a holiday if possible. You can purchase Ark Encounter tickets online (including parking which is $10 if you can park in one spot, $20 if you take up two spots). There is a petting zoo and zip lines at this location as well as camel and donkey rides. We did not visit the petting zoo at the Ark Encounter but I assume it is free while the other activities likely require an additional payment. Tomorrow we will venture into new territory as we retrace Daniel Boone’s steps and stay at the Cumberland Gap National Historic Park. For the first time on our trip we have NO planned activities for a solid three days! We are looking forward to some downtime that hopefully includes the beautiful outdoors. For some, this idea of perpetual travel brings about mental hives. For others, perhaps the thought encourages wistful wonder. Regardless of which camp you find yourself in, there is a possibility that the images conveyed by my Instagram account shout, “amazing fairytale life”. In the interest of reality, I’d like to bring a little balance to the table. I will be the first to agree that we live amazingly blessed lives. We consistently make efforts to remain mindfully grateful of the opportunities we have been given. That said, this fulltime traveling gig is not for the faint of heart. There are downsides. There are difficult days. Currently the change/consistent ratio is super skewed in the direction of change. We can hardly keep all 6 of us accurately knowing which state we are in before the answer changes. We don’t always know in the morning where we will be sleeping that evening. When we think we know where we will be sleeping, there’s always a chance we could be wrong. Today is a great example. As we pulled out of Trail’s End campground ((silent moment of thankfulness)) we confidently continued on our way, happy to have a short 2-hour drive before us. 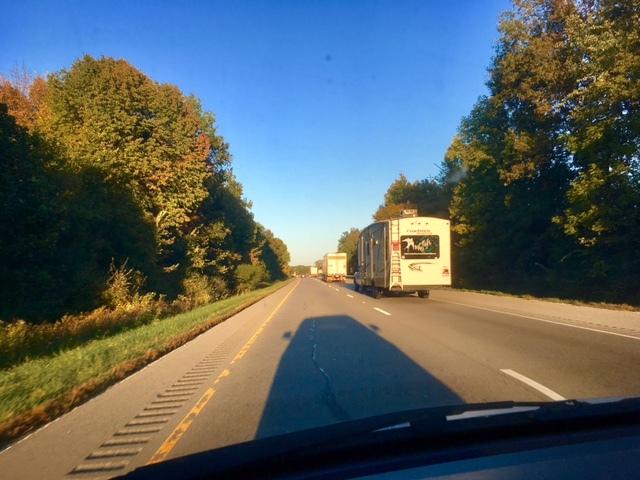 The thought of a short drive day with lots of downtime afterward seemed just the ticket to decompress from our busy week. However, upon arrival, we realized that because we had previously decided to stay an extra day in New Salem and an extra day in St. Louis, our schedule had shifted forward and what previously was a weeknight arrival was now a weekend arrival, and a holiday weekend to boot. Surprise! People like to camp on holiday weekends. The one available site was at an awkward angle that was too tricky to back into. Lesson: don’t assume you will have room to stay on a weekend just because summer is over. Pay a little more attention to the holiday calendar. Call ahead to check or make a reservation. We abandoned plan A and carried on down the road. Because plan B involved boondocking in a Wal-Mart parking lot and decompression at Wal-Mart is an oxymoron, the vote was to keep driving until we were ready for bed. However, not all Wal-Marts allow boondocking. When we were ready to call it quits for the day, the one we first stopped at was not interested in hosting us for the evening. Lesson: Call first before pulling into the parking lot. Some parking lots are tight and tricky to navigate through. Wal-Mart #2 was a go however and thankfully it was only another 15 minutes down the road. Because I’m learning as I go, thankfully I had a quick and easy “plan B” dinner option to fall back on when at 8PM we finally opened up the house and were ready to call it a day. After the kids were tucked in bed, Trent and I had a little “date night” activity. The lights hanging above our kitchen island had come loose during the drive and together we dismantled and repaired the problem. As I reflect on the day, I can also remember a period of 10 solid minutes of reckless crying in the backseat when Quinten’s apple fell onto the floor and more than one emergency potty stop on the side of the road. 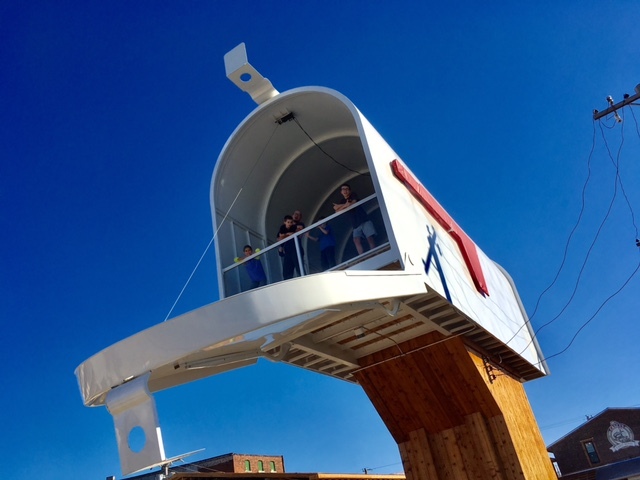 However, that one quirky town in Casey, IL where we parked the RV, everyone piled into the van, got ice cream cones at McDonald’s and took a side trip to see a handful of “world’s largest” items comes to mind as well. There was also that moment when Tanner confidently declared from the back seat that when he grows up he is going to own a campground and charge $1/night (actually at first he said he wanted to “be” a campground but we soon figured out his full intent). In addition, the seemingly endless fields of corn finally gave way to forests of trees tempted to turn the corner into brilliant color. And now, as I lay in bed with the bustling city’s sounds and sirens around me, I can hear the soft, silent breathing of my favorite person, asleep in bed next to me. This life isn’t glamorous or easy. Neither is marriage or parenting or homeschooling or any other number of things that add value and meaning to life. I’d rather wrestle through a challenging day, than surrender to a defeated life. What about you? What challenges in your day bring you down? What do you do to refocus yourself?